The Saxon anti riot vehicles used by the British Army and supplied in small numbers to various overseas organisations. It was developed by GKN Sankey, from earlier projects, AT 100 IS and AT104, and is due to be replaced by the Future Rapid Effect System. The vehicle is capable of carrying 10 personnel, including a driver and commander and 8 fully equipped infantry soldiers and the cupola is capable of mounting a 7.62mm GPMG for all round defence and low level air defence. It is designed to give protected mobility for mechanised infantry battalions against anti-personnel and anti-tank mines, small arms fire and shell splinters. 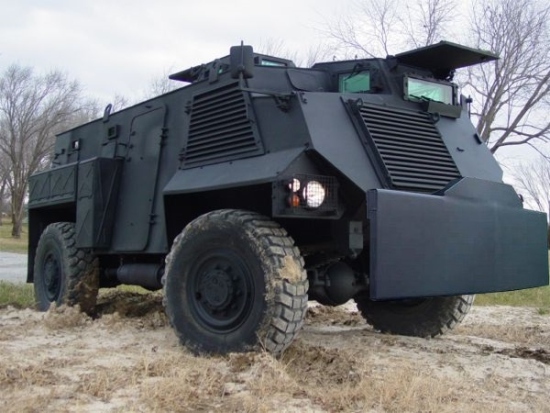 This variant is the �Patrol� which was developed with additional riot control wings and bull bars fitted.